The “default program” is the pre-determined run time setting programmed by the manufacturer. This run time setting is typically 10 minutes per station or valve to run every day. The controller will revert to this 10 minute setting if the battery back up is not installed and the controller is reset by the result of a power loss. It is a short term programming setting that will need to be adjusted immediately. Check your irrigation system run times to ensure that all grass areas and plant materials are getting the proper watering duration. Usually it is easy to tell when the controller is in default mode. Valves will turn on at different times and run for a shorter period. By installing your own irrigation system you can save hundreds of dollars. Even on small irrigation system installations you could save more than 50% of the cost of hiring a contractor. Our videos will take you through the entire design and installation process. We make it easy for you to understand and install the system yourself. Repair your irrigation system yourself. 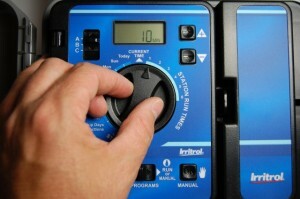 Our irrigation system repair manual makes it simple to tackle any problem. It will show you step by step procedures to fix piping and equipment. A simple repair can save you the cost of hiring a contractor to make a service call. A properly installed irrigation system can save hundreds of thousands of gallons of water over the life of the system. By correctly spacing sprinkler heads, they attain their optimum efficiency. Watering evening and consistently provides the optimum conditions for grass to thrive. This even coverage means that the sprinklers can run for a shorter period of time. Improperly spaced heads require longer run times to get the coverage required. Installing a highly efficient drip emitter system is the best way to deliver water to your plants. All your landscape plants will benefit from proper and consistent watering. They will respond with better growth habits and will be able to handle the extremes of wind and temperature fluctuations. Use our products to learn how to hire contractors to install and repair your irrigation system. Watch our videos to know what type of system you want and be able to communicate with a contractor during the design and installation process. Know how a system works, what products to request and how they should perform after installation. See how lawn sprinklers should be spaced and adjusted. Make sure the contractor has provided the right types of equipment, spaced the sprinkler heads correctly or installed the drip system properly. Use our repair manual to program your irrigation controller for optimum performance and efficiency.